Acoustic and Americana sounds blended with jazz drums and pop ideas into seven original songs. Nashville sidemen Kyle Kegerreis and Hans Holzen founded the HK band in fall 2002 as an outlet for their musical interests and backgrounds. These range from Americana to jazz to bluegrass. They have been performing since 2002 mainly in the Nashville area, usually with some of Music City's most talented musicians in the band. 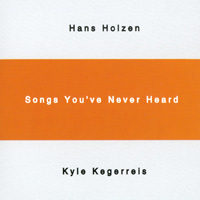 Their 2003 EP entitled "Songs You've Never Heard" features original compositions and a song by Kyle Addison and is available on CDBaby.com. Kyle Kegerreis learned to play upright bass in Louisville, KY, and Indianapolis, IN, his home town. He was very active in the Indianapolis jazz scene before moving to Nashville. Hans Holzen grew up around the Nashville music scene and studied guitar in Miami, FL. He returned to Nashville and formed the HK band with Kyle in 2002. Collectively Kyle and Hans have performed with Chip Taylor and Carrie Rodriguez, Robinella and the CC Stringband, April Verch, Clay McClinton, Shawn Camp, the Gypsy Hombres, Kami Lyle, Adrienne Young, Uncle Earl, the Nashville Mandolin Ensemble, Jennifer Nicely, and Claire Small. Musicians appearing on "Songs You've Never Heard" include Sam Baker of Lambchop, Casey Driessen of the Tim O'Brien Band, Andy Hall from Wheel House and sideman with Dolly Parton, and Lex Price who is currently touring with Mindy Smith. They each also maintain a busy schedule touring and recording with a variety of Nashville's top artists.